To mark the fifth anniversary of its Writers in Translation programme, English PEN has published an anthology featuring extracts from the 36 books that have been supported by the project. While this is great news by itself, Making the World Legible is free to download! I’m very excited – not only does this give us the chance to sample the writing of great authors, but we can also experience the art of translation being practised by some of the best in the business. I’m excited about the next two books I have lined up to read. Both are longlisted for the Giller Prize, which is the top literary award in Canada. The first book just arrived–it’s Jane Urquhart’s Sanctuary Line. I know some readers find her boring, but I’ve really loved the three books by her that I’ve read. There is so much going on under the surface, and her prose is breathtaking. I will review this for a future issue of Belletrista, so you can see what I think. After Sanctuary Line, I’m going to read Annabel, by Kathleen Winter. This was a New & Notable book from Belletrista Issue #5. After those two, I hope to read some spooky, ghostly books in keeping with the spirit of Halloween and all. Do you plan your reading in advance? What books are in your near future? On the anniversary of Belletrista, I looked back over the eight books that I wrote reviews on . . . Brixton Beach (Roma Tearne), Family Album (Claribel Alegria), Ines of My Soul (Isabel Allende), Horse, Flower, Bird (Kate Bernheimer), Song Over Quiet Lake (Sarah Felix Burns), The Disappeared (Kim Echlin), Salvation City (Sigrid Nunez), and For Grace Received (Valeria Parrella). All such very different books–how do I pick a favourite? Horse, Flower, Bird stands out as the one that wowed me the most. I had so much fun reading it, and even more fun writing about it. But it’s an odd little book, and not really one that you can get lost in on a rainy autumn evening when you’re cuddled up on your sofa, or when you need entertainment during a long flight. For that reading need, my favourite would be Brixton Beach. Roma Tearne’s writing is so beautiful, and she completely sweeps me away to the beaches of Sri Lanka (my favourite literary destination). I also loved Valeria Parrella’s gritty, real Italy in For Grace Received. But really, each of these books was great in its own way and I enjoyed something about each one. Interestingly, three of the books were short story collections–Family Album; Horse, Flower, Bird; and For Grace Received. I also just finished a fourth short story collection for a future issue of Belletrista–Garden in the Wind, by Gabrielle Roy. I find this interesting because I go years between reading short story collections. I’m finding that I actually like them more than I thought I did. But that’s what I love about reading–always learning something new, either about the world or about myself. 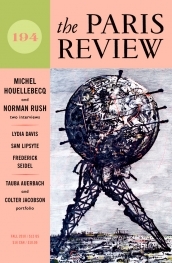 The literary journal The Paris Review has made its archive of writer interviews available on-line to non-subscribers. The archive holds interviews from the early 1950s to the present day. The vast majority of interviews are with the leading lights of the mainstream literary world, but I still think it’s worth exploring. I’ve bookmarked interviews with Nadine Gordimer, Toni Morrison, Simone de Beauvoir and Jean Rhys. All year I’ve been promising myself that I will have a period of focusing on writing from the Caribbean but I keep being distracted by other projects. But as the wet British autumn starts to approach I feel the need to read about places in the sun. I have a work by Jamaica Kincaid on my shelf. And I’ve recently read Breath, Eyes and Memory by Edwidge Danticat, which I loved. Her style reminded me of Toni Morrison – strong and unflinching. Anyway, I’m looking for recommendations of other women writers from the Caribbean, both fiction and non-fiction. I’m not so keen on poetry but if there’s a poet that I absolutely must try, I’m open to persuasion! I’ll be keeping track of my reading on the blog so you can see where it takes me. Egyptian author Adhaf Soueif (featured in Issue 6 of Belletrista) has posted a comment piece on the Guardian’s ‘Comment is Free’ site about the parliamentary elections taking place in her country in November. She explains the dominance of the ruling National Democratic Party and their moves against voices of opposition in the run up to the vote, and discusses the possibility of a boycott of the election. You may have seen Belletrista’s recent tweet about the article Lionel Shriver, author of We Need to Talk About Kevin, has recently written on Guardian Unlimited. In it she talks about her frustration with what she sees as the ghettoisation of women writers and women readers by the publishing industry. She highlights the recent adoring reception to Jonathan Rantzen’s latest work, Freedom, noting that a female novelist would never generate that kind of response because in America the literary ‘heavy hitters’ are exclusively male. Jodi Picoult has called them the ‘white male literary darlings’. I’d argue that there is a similar situation here in the UK. While writers such as Hilary Mantel and Jeanette Winterson sometimes get a look in, white male middle-class authors such as Julian Barnes, Ian McEwan and Martin Amis are so often cited as our intellectual literary cultural icons. Shriver also takes publishers to task about the way books written by women are marketed. The suggestions from a German publisher for two of Shrivers books that are written from a male point of view are covers with images of women. I haven’t read her other work but if We Need to Talk About Kevin is anything to go by, Shriver’s books do not warrant a remotely girly cover! The marketing of books written by women to women readers drives me crazy. I recently read a book that was written by a woman but told entirely from a male point of view; the cover was a whimsical, romantic, soft image of a young woman. But not the whole picture of a woman – just her body in a pose that suggested she was running away playfully from the camera. This was not a playful story. I feel like I’m seeing this kind of cover art more and more. Images of women on book covers very often don’t actually show a woman’s face, just a mysterious, elusive figure. Is that what publishers think women aspire to be? Or is what they think women should be? They also seem to think that we only really like books that are pink or sparkly or have swirly writing on the cover. The London Underground is full of ads for books marketed in this way – as you can imagine, my journey into work often makes me angry. Shriver tries to suggest an alternative for her novel, Game Control – a photo of sagging elephant carcasses. Unsurprisingly the publishers rejected that! Tell us about your Belletrista discoveries and win a prize! To celebrate our first anniversary, we’re going to give away two great prizes, one each to two of our readers! Each prize will contain two books which have been featured in Belletrista in some way, and one fabulous Belle bag! The packets can, we believe, be sent anywhere in the world with a viable mailing address. Names will be placed in a proverbial “hat” and two winners will be drawn at random from those who have entered. We will contact the winning names to obtain your mailing address. To enter to win, just post here, and tell us, in just a few sentences, about a book or new author you discovered through Belletrista! *Belletrista reviewers, writers, and board members are not eligible. *Books included will be chosen by Belletrista. *Winners mailing addresses will not be used for anything other than to mail their prize to.